'Bushwick' tells the story of Lucy, a young woman who is taking her boyfriend to visit her family in the Bushwick neighborhood of Brooklyn. But after they get off the subway, they realize that something is wrong. First off they hear an evacuation notice in the subway and then a man comes running into the subway totally engulfed in flames. When her boyfriend decides to run out to find out what is happening he too is killed. Lucy then decides to take her chances and make it to the Bushwick neighborhood to make sure her grandma is okay. But with all the violence and chaos going on she is finding it hard to even get close. When she is chased into a basement of an old home her attackers proceed to abuse her but she gets lucky when the owner of the house, Stupe comes to her rescue. She finds out the Stupe is an ex-marine who is headed to the safe zone to reconnect with his family. Lucy then convinces him to help her get to her grandma before something happens to her. This starts the journey of these two unlikely partners as they make their way through the neighborhood. The synopsis sounded interesting enough to me before watching the film and I did enjoy the opening scenes but after a while I realized that the story wasn't really going anywhere. The dialogue was at times beyond bad and the acting at times was sub-par as well. I do give some of the acting a little bit of a break because the dialogue they had to work with wasn't very good. All they did was run around bitching and moaning the whole time. I will admit I am not really a fan of Dave Bautista but he was about average here. But on the other hand I thought Brittany Snow did about as good a job as possible playing Lucy with all things considered. The rest of the acting ranged from average to bad. ‘Bushwick’ definitely had potential but the writing needed more work. The film's low budget also hurt the production values a bit but that was never a factor to me. Directors, Cary Murnion and Jonathan Milott did their best with what they had to work with but the writing from Nick Damici and Graham Reznick let them and the cast down. I did enjoy the director's film, "Cooties" so they are talented film makers and I do look forward to seeing what they do next. If you like the synopsis and/or the film's stars then go ahead and see the film for yourself. 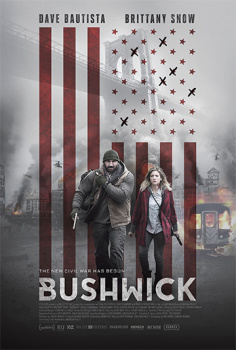 'Bushwick' is availa now on DVD and Bluray/DVD Combo.